Since salesforce moved code coverage to developer console, I somehow didn't like it,waited for a while.... and again for like months and no go :( , Salesforce never brought back the old listviews, I was quite missing this little feature that lets you to have a quick glance of the code coverage. After few weeks finally planned to build something for myself. This was a great chance to learn a thing or two about Tooling API and a chance to mix some js libraries together to brew something really cool. The page uses the Tooling API REST service to retrieve the code coverage result. To get the data from the endpoint the method sends the query along with the session id to get the response as JSON string which again used in the JS to render the UI. JSRender takes the job of rendering the data received from the service and use them to generate the table. The templates are pretty easy to handle once you have the data and the decided upon the HTML structure, you can easily create them. The above template just displays the data received from the remoting method, lets extend the template to show more info like percentage, totalNumber of lines and may be a background color ? and this html can be appended to an existing table in the page to generate a table with the data. 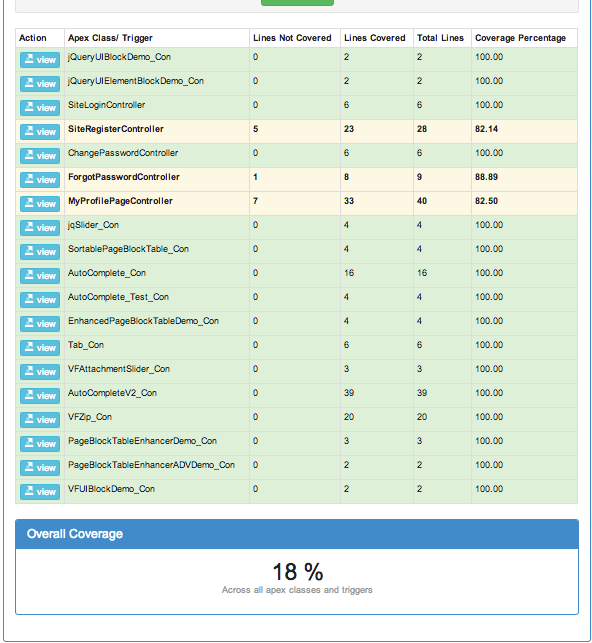 So the final product a fast good looking page to view the org code coverage. Installation : You can follow the project detail link to install a unmanaged package of this page. If you already have visualstrap unmanaged package installed you may have to remove it or you can use source from github to install the same. Well I tried out the package just now and looks like its working. Did you flow all the instrcution from the project page ? like remotesite setting etc. hi maiti when iam trying to install the packge its throwing error like contact salesforce.com support. could you please help me on this. I just tried with a fresh org looks like its working for me. Can you send me the screenshot of the error ? or may be try in another org ? There are more than 800 classes in my org. Can you please help me with this issue? awesome post i really like this post.keep sharing the post.